The JSON file is updated regularly. It contains timestamp and jsonUpdatedTime fields that enable you to identify when the JSON file has been updated. I do not use live data, everything is cached. Feel free to use the link in your own scripts. I try to keep the link and format active. If you have questions or need any further information, please comment or contact me. 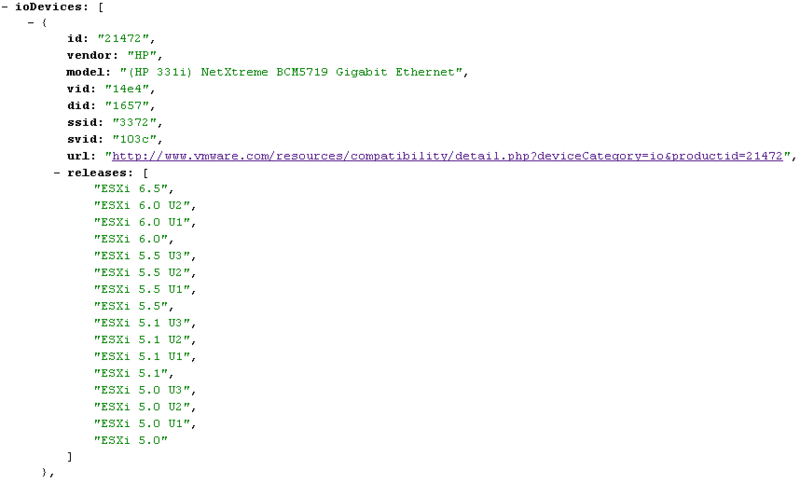 Currently, the JSON file only contains device information and a link to the official VMware HCL, as shown in the screenshot above. It does not contain driver information which might also be very helpful for automated health checks. I'm working on getting supported driver version information to the list. Exception calling "Format" with "2" argument(s): "Value cannot be null. Fixed. The variable should be $device. not $hba. I have a problem running this script from my office pc that is behind a proxy server using windows credentials. After that, the script runs without errors but doesn't produce any output. Do you have any suggestion or idea? It would be very userfull if supported driver and firmware versions where included. It is possible but would bloat that file massively as there are many firmware/driver combos per ESXi version. Also, you have to fetch this information from each device. First of all thank you for the post - extremely useful. How can I get the supported firmware/driver versions and add it to the file?